Episode #132: New Krypton: The Aftermath! Superman: War Of The Supermen 1 (of 4), cover art pencilled by Eddy Barrows, inked by J. P. Mayer and colored by Rod Reis! With the publication of SUPERMAN: WAR OF THE SUPERMEN issue 4 (of 4), the NEW KRYPTON story comes to an end after covering two years. In this episode I discuss part of this final issue, and some of the consequences that have come out of the story. Also reviewed in this episode are some of the upcoming story lines that are listed at DC Comics' website http://dccomics.com. Next Episode: HAPPY BIRTHDAY, DAN JURGENS! Episode #131: Al Williamson, Superman Inker! 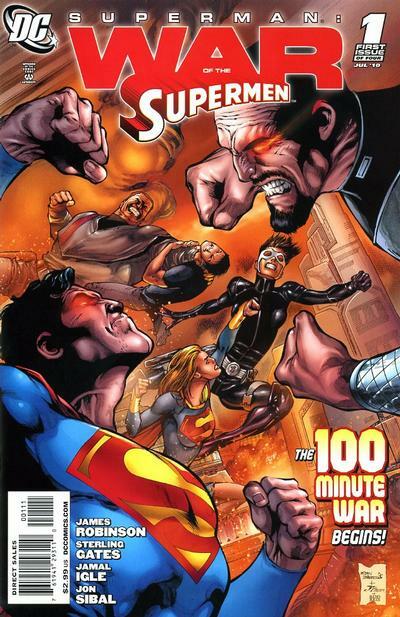 The cover for Superman 416, drawn by Eduardo Bareto. with the interior stories written by Elloit S! Maggin, pencilled by Curt Swan and inked by Al Williamson! Comic book artist Al Williamson died last Saturday, June 12, 2010. He was born on March 21, 1931. His comic book career began when he was 17 years old, and he was the youngest artist in the EC Comics bullpen. He is most well known for his adventure and science fiction stories, such as the comic strip and book FLASH GORDON, as well as the comic book adaption of the movie STAR WARS: THE EMPIRE STRIKES BACK. Beginning in the 1980's he had a 20 year career as a comic book inker, first at DC and then Marvel. At DC, Al first drew and inked an 8 page Superman story, THE LIVING LEGENDS OF SUPERMAN, for SUPERMAN 400, October 1984. He inked SUPERMAN issues 408 - 416, with the exception of 411, which was the Julius Schwartz birthday issue (discussed in episode 78). He also inked Superman stories for DC COMICS PRESENTS 79 and 85-87. Al inked two covers for SUPERMAN, 408 and 409. This episode highlights the one issue of SUPERMAN that I have which Al Williamson inked, 416, February 1986, published on November 18, 1985. The first story, THE EINSTEIN CONNECTION, was written by Elliot S! Maggin, pencilled by Curt Swan, colored by Gene D'Angelo and lettered by Ed King. This story was reprinted in the trade paperback SUPERMAN VS. LEX LUTHOR. 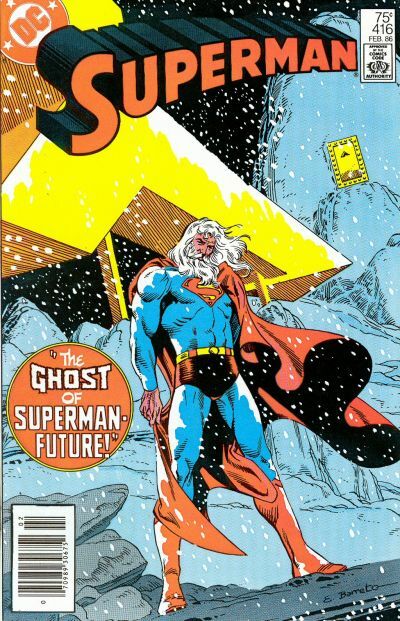 The second story, THE GHOST OF SUPERMAN-FUTURE, had the same creative team, except for letterer Dave Andrews. Episode #130: Happy Birthday, Ross Andru! (L to R:) Superman Vs. The Amazing Spider-Man (January 1976), cover and interior art pencilled by Ross Andru, and Superman 204 (February 1968), story art also drawn by Ross Andru! Ross Andru was born on June 15, 1927 and died on November 9, 1993. He was a comic book artist and editor who worked mostly with inker Mike Esposito. Andru is most well known from his five year stint as the penciller for THE AMAZING SPIDER-MAN during the 1970's. During that decade he was the penciller on the first DC/Marvel cross-over, SUPERMAN VS. THE AMAZING SPIDER-MAN. Andru is also credited as the co-creator of the Punisher with writer Gerry Conway. He also had a long career working for DC Comics on a variety of titles in different genres. Andru also drew stories for the Superman titles. His first Man of Steel story was for SUPERMAN 204, February 1968. He drew various issues of the title through issue 216, May 1969. For ACTION COMICS he drew stories for various issues from 363, May 1968 through 393, October 1970. For WORLD'S FINEST COMICS, Andru pencilled stories for issues 180, November 1968 - 195, August 1970. And for SUPERMAN'S GIRL FRIEND LOIS LANE he drew stories for issues 105, October 1970 - 110, May 1971. 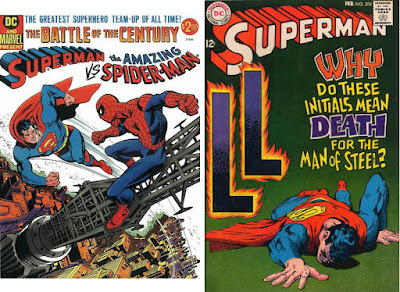 The featured Ross Andru Superman story for this episode is THE CASE OF THE LETHAL LETTERS, which was published in SUPERMAN 204. the 13 page story was written by Cary Bates and inked by Mike Esposito. The only reprint of this story I am aware of is LIMITED COLLECTORS' EDITION PRESENTS SUPERMAN C-31, November 1974, which I have and was where I first read this story. The cover for this edition was a photo of a painting of Superman, done by the artist H. J. Ward. It hung in DC Publisher Harry Donenfeld's offices for many years, and can now be found at the Lehman College library in the Bronx, New York City. For more information about the comic book career of Ross Andru, read the book ANDRU AND ESPOSITO: PARTNERS FOR LIFE, written by Mike Esposito and Dan Best, published in 2006. Next Episode: AL WILLIAMSON: SUPERMAN INKER! Episode #129: George Pèrez On ACTION COMICS! 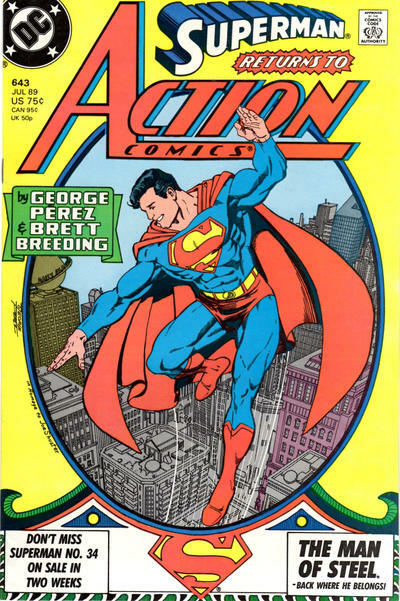 Action Comics 643, cover drawn by George Pèrez, after Joe Shuster's cover to Superman 1! George Pèrez is well known for his work on THE NEW TEEN TITANS and WONDER WOMAN beginning in the 1980's. He also had a short but excellent run on Superman stories in the pages of ACTION COMICS, from issue 643 July 1989 - 652 April 1990. This episode explores these Superman stories that George was involved with as both writer and artist. For more complete coverage of these stories, go to the podcast FROM CRISIS TO CRISIS, which can be found at the SUPERMAN HOMEPAGE http://supermanhomepage.com/news.php, or THE FORTRESS OF BAILEYTUDE http://www.fortressofbaileytude.com. NOTE: The sound quality of this episode sounds different because I recorded it using my son's laptop. Next Episode: HAPPY BIRTHDAY ROSS ANDRU!